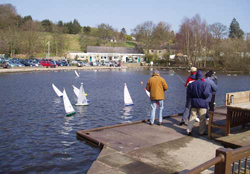 Nestling in the foothills of the Pennines, the park is so attractive that an estimated quarter of a million people a year visit and many of them linger by our lake to admire our craft. The lake we sail gives plenty of space for Fiesta yachts , fast electric racers, scale warships and other vessels, with even the odd submarine popping up. While the rest of the world may be filled with pressures and concerns, our hobby allows us to enjoy the location, watch our boats in action and chat with other people curious about the construction, workings or history of them. Copyright © 2017 The Marple Website. All Rights Reserved.